I was fortunate to take a twisty path through my college years; I attended a wide array of programs around the country and overseas that really opened my eyes to various perspectives and approaches to earth repair, which I came to realize also called for the healing of social relations, too. As a college student in the early 2000s, I struggled with two aspects of my emerging personality; one was the desire to spend time outside as much as possible in my life, and the other was my increasing awareness of environmental destruction and its devastating implications. As many young people at that age, I felt a bit daunted and helpless at the situation; how was I to do anything to make any change in the world? During that final year of completing my degree at Empire State College, I met two individuals that forever changed what I saw and how I would come to understand my niche in career, livelihood, and passion. The first was co-author Ken Mudge, who I met teaching a Forest Farming class at Cornell, which I first audited and then began co-teaching. This relationship began the journey which resulted in coloration on research, then the writing of Farming the Woods. Ken’s passion and dedication to the idea of forest farming, and in particular woodland mushroom cultivation, led to the development of this crop as a viable commercial enterprise for farmers. The other person who changed me for good was a local forester, Mike Demunn. I’d heard that Mike was different from many of the others I’d come across in my studies. Part Haudenosaunee native, he was raised by a Seneca Clan mother and given the name Da’ Ha’ da’ nyah, meaning “he protects the forest.” Mike also attended conventional forestry school and worked for the U.S. Forest Service, National Park Service, and the Soil and Water District, and for industry as head forester for a large lumber company. He is a person who has walked the edge between two worlds, combining understanding of forest from both perspectives. The result? The woods he now caretakes are a testament to what forestry can be. A visitor could step into a forest that Mike thinned and hardly notice anything had been done. The diversity, health, and wildlife value of these forests is in better shape than when he found it. Walking in the woods with Mike made me realize that, while I had spent a lot of time in the woods over the years, I wasn’t seeing the full picture. I fact, I was barely scratching the surface. During that semester we toured groves of old growth trees, forests he had thinned over decades, and a few forests that had been destroyed from poor management. Along the way I leaned the stories of 400-year-old White Pine stumps, American Chestnut suckers hidden deep in the woods, and of the potential for people to do good by the woods, all while harvesting timber, firewood, and other products for use. Mike’s response has been, “ah, don’t waste your time and money. I could teach you what you need to know in five days.” In many ways this was true for me – I learned more in 6 months of shadowing Mike in the woods than in many college courses. One of the realizations I’ve come to having worked many hours in the woods, is that forestry and agroforestry are inherently humbling practices, because when we enter the world of trees and forests, we have to look beyond years and decades, and start thinking about centuries. Many of the consequences of the choices we make (good or bad) in our lifetime, won’t be seen until the next generation. 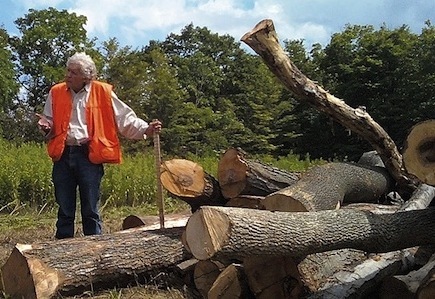 Working with both Mike and Ken have instilled in me the notion that collecting, storing, and sharing the wisdom of one generation of forest stewards is essential to keeping healthy forests around for the long haul. This cultural preservation is as important, if not more important, than learning tree ID or and farming and forestry skills. This idea was the reason I wanted to write the book with Ken, and it serves also as the inspiration for the upcoming Forestry & Agroforestry Short Course (July 24 – 28), which has been several years in the making. While the reality is that mastering an understanding of the forest is something that takes a lifetime (and school can help too! ), this training will be a great start for anyone who wants to see the forest with new eyes, and take home practical principles they can immediately begin applying. 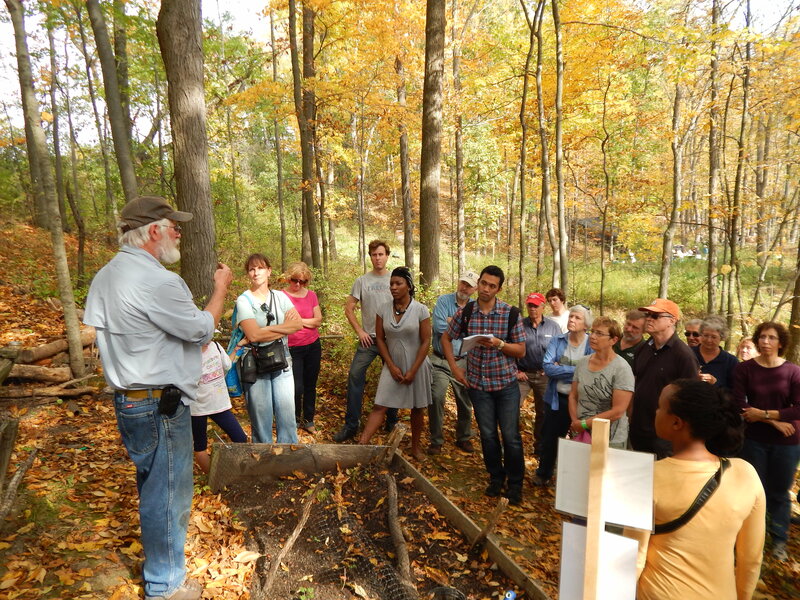 In addition to learning forest ecology and management from Mike Demunn, the class will also touch on the practice of agroforestry, which looks at the blend of forestry and agricultural production. Participants will tour Angus Glen Farm, a prime example of Silvopasture, where animals and trees are mixed. They will also spend time at the host site, Wellspring Forest Farm, which I co-steward with my wife Elizabeth, where mushroom cultivation, maple sugaring, ducks, and forest medicinals are all part of the woodland landscape. 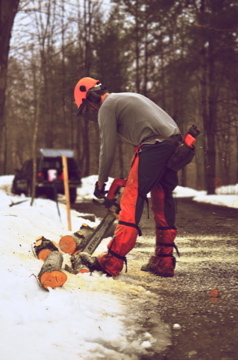 INHABIT: “Farming the Woods” with Steve Gabriel from Costa on Vimeo. The base tuition for the course is $450, which includes instruction, materials, and local, organic lunch for each day of the workshop. You can stay in a local hotel or B&B (look for accommodations in Watkins Glen, Trumansburg, or Ithaca) or camp onsite for $10/night ($50 for the course). Camping facilities at Wellspring Forest Farm include a simple camp kitchen, compost toilet, outdoor shower, and pond for swimming. In addition to tuition and camping, if you are able please consider making a $100 donation to support reduced tuition for other students who may have less means to attend.